There’s no better time to overhaul your health (and your family’s) than at the start of a new year. If you ate one too many treats over the holidays, now is the time to focus on your health. As we’ve all most probably gained a few pounds over the holidays, I thought that I would share a few tips for making mealtimes healthier. It’s much easier and less stressful to make healthy meals that the whole family will like, rather than cooking your food separately. 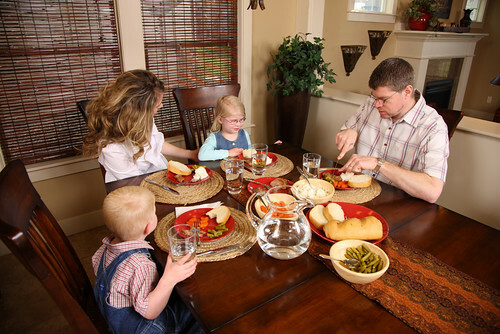 To help make family mealtimes healthier, here are a few tips to take note of. The main reason meals are unhealthy is because we put sauces and stocks in them that we haven’t made ourselves. The truth is that shop bought sauces, soups and stocks are high in fat, salt and sugar. Yes, even the low-fat ones. If you want to be healthy, you need to make all your meals from scratch. Don’t panic, making homemade sauces, soups and stocks isn’t as hard as you would think, it’s actually, pretty simple. The most important thing is to follow a recipe, to ensure that they taste good. By making all your meals from scratch, you know exactly, what goes into them and how healthy they are. Another reason that family meals are unhealthy tends to be because of a lack of time. When us mums are busy, we often make the mistake of thinking that our only option is to buy a ready meal or a jar of premade sauce. These types of foods are full of fat, oil and calories, meaning that if your family eats them regularly, you’ll soon gain weight. Even when you’re busy, the only option isn’t readymade food. If you’re organised and invest in the right equipment, you can ensure that no matter how busy you are, family meals are always healthy. For us busy mums, a slow cooker is a must-have as they make preparing meals so simple. All you need to do is chuck a few bits and bobs in there in the morning, and come tea time; your dinner will be cooked to perfection. For cooking quickly, a fryer can also be an excellent tool. Sadly, regular fryers are incredibly unhealthy. But the good news is that the invention of air fryers means that we can now fry food in a healthy way without the use of any oil. This means that fried meals are lower in fat and calories, and are much healthier. To find out about all the best air fryers, check out www.airfryerreviews.com.au. Here you can read various reviews and comparisons to see which fryer is best for you. If you want to be healthier, change your family to low-fat foods, instead of full-fat ones. From milk and cheese to yogurt and snacks, there are various low-fat alternatives to choose from. For healthier snacks, make them yourself. That way, you can control how much fat goes into them and how healthy they are. Also read labels, get to know the fat and sugar content of the foods you eat, life is about balance so make sure the foods you buy and eat have a balanced sugar and fat content. If you have a browse online, you should find plenty of recipes for low-fat alternatives to high-fat foods. You can make everything from hummus to biscuits and cakes using low-fat recipes. So whatever snack foods you like, you’re covered. And there you have it, all my top tips for making family meals a little healthier.